Airline chicken is a boneless cut of chicken breast with the skin on and the drumette (first wing joint) attached. It makes for a great presentation, commonly served in fine dining restaurants and on airplanes. To differentiate from the usual chicken breast and make the serving portion to appear bigger, airlines utilized a small piece of the breast but kept part of the wing on. Also, known as a frenched breast of chicken. 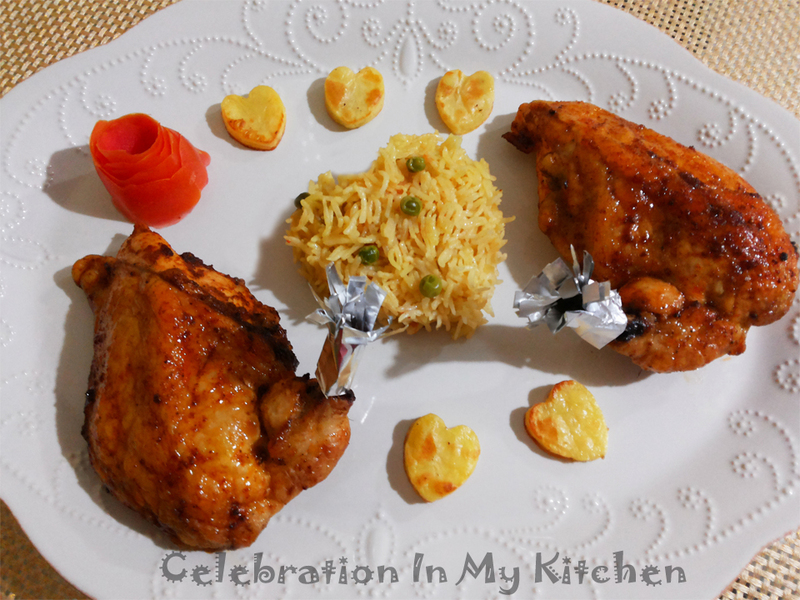 On Valentine’s day, I wanted to treat the family to a first class meal so prepared roasted airline chicken, which I served with pea pulao and baked potato hearts. I have utilized breasts from two chickens, thus achieving four airline chicken breasts. They were marinated with the spice paste and then roasted in the oven for less than 30 minutes. Served warm, they were moist, flavourful and amazing. Perfect to celebrate a special occasion and create beautiful memories. The potato hearts were cut using the heart-shaped cookie cutter. They were dressed with extra-virgin olive oil, pepper powder, salt and baked. Made a pleasant accompaniment and an ideal look for Valentine’s day meal. Wash the breasts, pat dry and season with salt. Mix all the ingredients for the spice paste in a bowl. Apply to the breasts, cover and let them marinate in the refrigerator for a couple of hours or more. Preheat the oven to 400 F or 200 C.
Line a baking tray with aluminum foil and grease with oil. 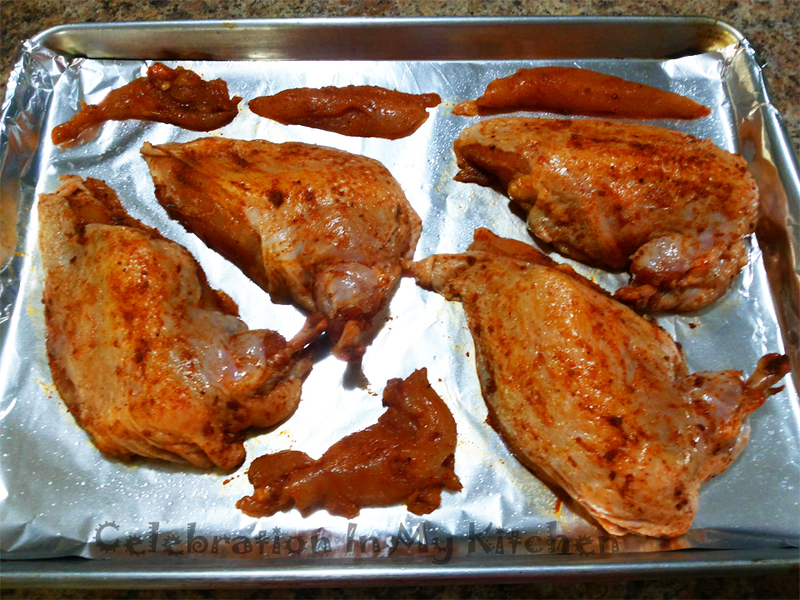 Place the airline chicken breasts, skin side up in the prepared tray. Roast for 20 minutes or till almost cooked through. Mix honey, wine together and brush on the skin using a silicone brush. Transfer back in the oven for an additional 5 minutes till the skin is golden brown with a a beautiful glaze. Do not overcook the breasts or they will dry out. Remove the tray from the oven and let the breasts rest for few minutes. Serve warm with potato hearts. Peel and wash potatoes. Cut into 1/8” slices and then with a 1” heart-shaped cookie cutter, cut each slice into hearts. Coat hearts with oil, pepper powder and salt. Serve baked hearts with roasted airline chicken breasts.